Kitchens – A hazardous Zone? Recent fires in the UK have highlighted the devastation which can result from fat fires originating in food processing equipment or extract systems. This article will explain why these fires can escalate so rapidly and described the role of automatic suppression systems in extinguishing such blazes. Fires involving cooking materials, such as grease, fats and oils, have long been the cause of the property loss, injury and death. These fires are unlike others due to the unique way in which they develop. This fact has been recognised for many years by the various standards institutions, including the National Fire Protection association (NFPA) in the USA, the UK’s British Standards Institution (BSI) and the International Standards Organisation (ISO). As a result of the special nature of these fires these institutions have developed standards which define a classification for cooking oil fire – Class F (Europe) and Class K (North America). Tests carried out by the Loss prevention Council and other agencies around the world have provided an insight into this unique fire hazard. Unlike more flammable liquids such as gasoline, lubricating oil, paint thinners or solvents, the auto-ignition temperature for cooking oils used for frying can vary immensely. Auto-ignition can occur anywhere from 285oC to 385oC. For auto-ignition to occur, the entire mass of oil, whether in a small pot or in a commercial deep fat fryer, must have been heated beyond its auto-ignition temperature. However, once ablaze the oil changes composition slightly resulting in a new auto-ignition temperature which may be as much as 30oC lower than its original auto-ignition temperature. This results in the fire being self-sustaining unless the entire mass of oil is cooled below the new autoignition temperature. In the mid-1960s it was discovered that by applying sodium or potassium bicarbonate powder to burning cooking oil, a unique phenomenon called saponification would occur. All cooking oils, greases and fats contain saturated fat in the form of free fatty acids. When an alkaline extinguishing medium (such as sodium bicarbonate powder) is added, the free fatty acids react with the sodium bicarbonate for form a soapy foam on the surface of the oil – the process of saponification. This foam acts like a traditional firefighting foam. It secures the vapours, generates steam and extinguishes the fire. Saponification only occurs when an alkaline extinguishing agent is added to the oil. Hence multi-purpose powders and those suitable for extinguishing A, B or C class fires, which contain the acidic base chemical ammonium phosphate, do not support this reaction. Tests have shown that when powder extinguishants are used the resultant saponification is not sufficient to cool down the entire mass of a deep fat fryer. Extinguishers capable of suppressing 28m 2 (300sq ft) heptane fires are incapable of extinguishing the 0.2m2 (2.25sq ft) surface of a deep fat fryer, even when sodium bicarbonate is used. It was discovered that wet chemical agents comprising liquid solutions containing an alkaline mixture (typically potassium acetate, potassium citrate, potassium carbonate or combinations thereof) were far more effective in extinguishing these fire. The combination of a fine mist spray coupled with the saponification characteristics of the wet chemical secured the vapours and cooled the entire mass of oil below its new auto-ignition point. 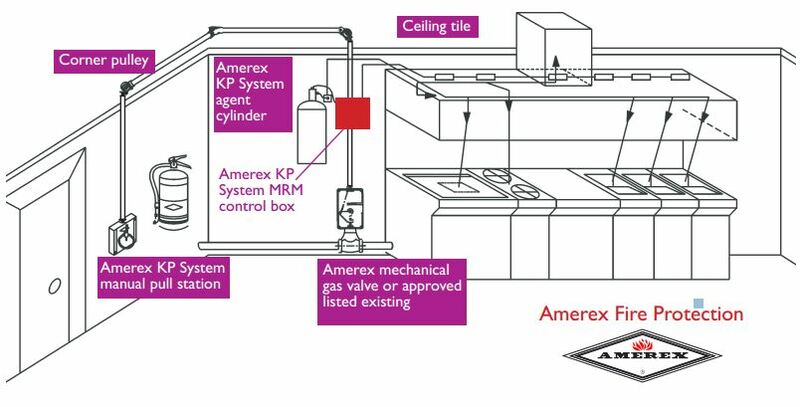 Automatic systems, Amerex KP and Zone Defence have been tested on real deep fat fryer fires by the LPCB to LPS 1223 Requirement and testing procedures for approval of fixed fire extinguishing systems for catering equipment and have proved most effective. These systems use an alkaline wet chemical solution delivered through a piping network to a fine spray mist nozzle specifically designed and tested for a particular appliance, total flood coverage, plenum area or duct. The system will discharge either automatically in response to fire appliance through activation by thermal detectors or detection tubing located behind the grease filters; or it can also be activated manually. These same types of systems have proven extremely effective in extinguishing catering equipment fires in the United States, where systems are mandatory, and in other countries. In commercial cooking operations, fryers and other appliances are often turned on early in order to have them heated and ready for cooking when needed. It is not uncommon for kitchen employees to leave the area and perform other tasks while the fryers warm up. Fires can and according to incident reports, do occur when fryers are left unattended and no one is present to use extinguishers. Automatic systems do not rely on personnel being present in order to operate. Automatic suppression is equally applicable to vapour extract systems. Fire within these structures can occur unseen and are difficult to detect in the early stages. These particular fires are also difficult to extinguish without a fixed systems since accessibility is a problem when using hand portable extinguishers. As well as fast and sure extinguishment of cooking fires, properly tested and regulated automatic systems bring with them an assurance that they will perform as intended in real fire conditions. To gain approval from bodies such as the Loss Prevention Certification Board (LPCB) these systems are tested under extreme fire conditions. Each system is specially designed to extinguish a fire occurring in the cooking facility. LPCB conducts a rigid and consistent testing procedure as laid down in LPS 1223. This involves simulating heavy grease loading, long ‘pre-burns’, specific nozzle locations and extreme conditions to ensure that the systems will perform properly. Mistakes such as incorrect nozzle location and improper handling of a portable extinguisher are taken out of the equation by placing fixed nozzles over specific hazards. This, when coupled with the LPCB’s strict requirements for regular inspections and maintenance, provides a package of protection which is aimed at preventing the disastrous fires which have occurred recently in the UK in this type of risk.The combination of stringent testing, proven design, reliability and automatic discharge make LPCB-listed wet chemical catering systems the best defence against fires in commercial cooking operations. Quick and effective extinguishment of these fires prevents personal injury, business interruption, equipment loss and structural damage buildings.